It was a bad way to die. The evening of Friday, July 22, 1977, my father, William Wallace Stroby, was piloting his 36-foot boat, the Dawn I, a few miles off Monmouth Beach. He'd gone fishing with a friend that afternoon, and as the day wore on the water had turned choppy, the horizon gray. He was up on the flying bridge, steering the boat, when the buzzer went off indicating the engines had stalled. It was a fairly common occurrence, usually requiring only a quick manual restart. Later, we would try to piece together what happened. Maybe he climbed down the wooden ladder from the flying bridge too quickly, the steps slick from spray. Perhaps the boat rolled and he lost his balance, struck his head on the way down. His friend was inside the cabin and saw nothing. All he heard was the splash. He ran on deck to find himself alone. He had no idea how to operate the boat or the ship-to-shore radio. The night was closing in and the boat was drifting. He tossed a life preserver into the water, hoping my father might surface, see it and swim to it. He never did, of course. He was gone. It was a week before his 55th birthday. I was 16. There is always risk in being on the water. But my father had met the sea once, on its own terms, and bested it. 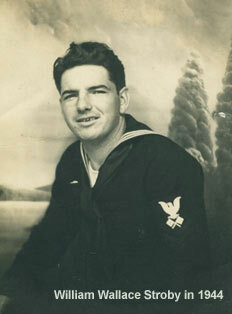 During World War II, he'd been a signalman onboard a destroyer, the USS Cushing, serving in the South Pacific. In the early hours of Nov. 13, 1942, the Cushing was leading a formation of U.S. ships when it was unexpectedly caught up in a chaotic night battle with a Japanese task force off the coast of Guadalcanal. Pinned in a crossfire, disabled and burning, the Cushing was finished off with a point-blank salvo from the Japanese destroyer Terutsuki. Many of the crew were killed outright. Others were trapped in the battered ship as it slipped beneath the waves. Wounded by shrapnel, my father abandoned ship with the other surviving crewmen, leaping into the water and making for the few lifeboats that had been launched. The Cushing was the first casualty of a battle that lasted well into the next day. With no chance of rescue while the fighting continued, my father and his crewmates spent 14 hours in the water. When the Pacific sun rose, it illuminated a seascape of burning ships, oil slicks and floating corpses. American aircraft would eventually drive the last of the Japanese ships away, and boats were launched from Guadalcanal to rescue the men in the water. Almost half of the Cushing's 150-man crew had been lost. When the battle was finally over, more than a dozen ships from both sides had been destroyed or disabled in a stretch of water that would come to be known as Iron Bottom Sound. My father had faced death that night, and he knew it. Though he stayed in the Navy, serving on other ships until war's end, in some ways, those days off Guadalcanal were the most vivid of his life. The official Navy photograph of the Cushing would hang on the wall of his office for the rest of his life. When he eventually returned to the States, he met my mother - Inez Dorothy Morelli, a nurse from Long Branch. My father had been raised in a rural farm community in western Monmouth County, but after they were married, he moved to Long Branch and became an apprentice to his uncle, Curt Reid, who ran a land-surveying business. My father would succeed him after his death, and in the development-crazed decades that followed, William W. Stroby & Associates would become one of Monmouth County's best-known - and busiest - surveying outfits, with offices in our house in Long Branch. But my father never lost his love of the sea. We lived only blocks from the beach, and when the business was doing well enough in the early 1970s, he allowed himself his first real toy - a 22-foot cabin cruiser named the Tyella. During the summer, he'd go fishing every weekend and would often spend the night onboard dockside, lulled to sleep by the motion of the water. When he was able to, he bought a bigger boat - the Dawn I - for $10,000, an unheard-of expense for the time. And it was that boat he was piloting in July 1977, when the engines gave out and the sea called for him again. My father was a rough-and-tumble farm boy, a bar brawler on occasion, but he was a reader. It was a habit he'd picked up in the Navy, where long voyages often meant hours of boredom. He read everything he could get his hands on, and I learned by his example. In the year or so before he died, I'd discovered the great hard-boiled writers of the 1930s and '40s - Hammett and Chandler and, my father's favorite, James M. Cain - and we'd found common ground there. I had favorites of my own - the pulp action novels of Don Pendleton and the terse, hard-edged crime tales Donald Westlake wrote under the pen name Richard Stark. My father borrowed and consumed these just as eagerly as he did a historical novel by Frank Yerby or a scholarly work by Samuel Eliot Morrison. On the day of that final fishing trip, the Stark novel "Deadly Edge" lay open and face-down on the bookshelf in the headboard of his bed, where he'd left it the night before. I was the youngest of four children, and by 1977 my older brothers and sister were already out of the house, raising their own families. My mother and I were accustomed to my father's fishing trips lasting well into the night, so I'd gone to bed that Friday unaware anything was wrong. The next morning I was woken by my oldest brother, Bill, who lived an hour south. He told me what had happened. They were still searching, he said. They might yet find him. I got dressed and went downstairs to find a houseful of people, my mother sobbing at the kitchen table. The calls had gone out to friends and relatives, and my father's disappearance was already on the local radio news, WJLK out of Asbury Park, the station we listened to in the kitchen every morning as we had breakfast. The boat had drifted for much of the night, eventually beaching at Gateway National Recreation Area at Sandy Hook. There my father's friend told the park rangers what had happened, and the Coast Guard was called in. Patrol boats and a helicopter were sent out to search. Later that morning, Bill and I drove up to Sandy Hook. 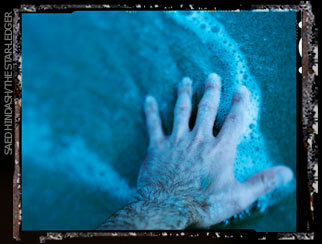 It was low tide and the Dawn I sat high on the beach, battered and abandoned, surrounded by the curious. On Sunday, they called off the search. It was weeks before they found the body. I still live near the beach. Closer now than ever, actually. I'm a few towns south of Long Branch, but a block's walk takes me from my front door to the ocean. The two crime novels I've published have both been set at the Jersey Shore, and the ocean figures in each. The sea gives me my bearings, geographically and philosophically. I miss it when I'm away, and I feel an edge of nervousness when I'm somewhere that's totally landlocked. I need that unending horizon, that sense of limitless space close by. Living near the ocean is like living on the edge of forever, a beautiful abyss. Eternal but ever-changing, hypnotic and merciless. But I have no fear of the sea - of swimming or boats or drowning. My father would not have stood for that. The sea was his life. It carried him to adventures far beyond the New Jersey farm he'd grown up on. It was the place he felt most alive. And though I don't own a boat and have little interest in them, I keep the sea close at hand. What I do have is a sense of impermanence, of the futility of planning too much, or taking for granted the days to come. Of the finiteness of time. I've been told it's a theme in my books, and though I don't think I was aware of it, I have no doubt it's true. I do know that much of my philosophy and behavior - for better or worse - was shaped by what happened on that summer day 28 years ago. And in those intervening years, nothing has convinced me otherwise. The truths I learned that summer were simple ones, but truths nonetheless, and I can't turn away from them. Like the ocean, they are always there. We make our plans, we build our nests. We live our lives. And then one day the sea calls.